We're all responsible for ending school shootings. Here's how yoga, mindfulness, and social-emotional learning can help. If you’re like me, the current escalation of violence in our schools and in our society can feel extremely overwhelming. The technological world is accelerating so rapidly that it seems nobody has a clue what’s going on—and it appears that every day there are more depressed, angry, and downright mean people out there spreading hate and violence. As much as the weaker part of me would like to lean on my white male privilege and put my head in the proverbial sand, as co-founder of Breathe For Change—a movement to enhance the well-being of teachers and students through mindfulness and yoga—I have a responsibility to grapple with these issues head on. Fortunately, from the massive turnout for March For Our Lives, I can see many others are also ready to take responsibility… so then the question is: what do we actually DO? 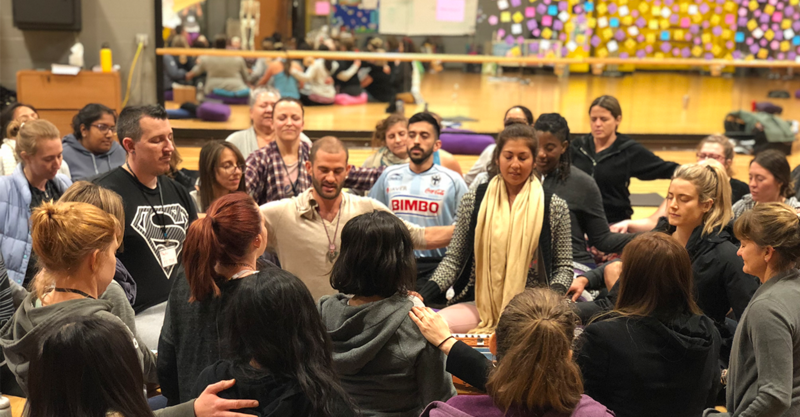 In listening to the voices of tens of thousands of educators and wellness experts across the country, I have found that there are powerful principles of yoga, neuroscience, and social-emotional learning that we can draw upon to see through the overwhelm and turn times of tragedy into times of possibility. Neuroscience teaches us that well-being is a skill; it can be learned just like any other skill, through repetition, practice, and study. It also reveals that our brains have neuroplasticity; that is, the more we think a thought, the more it shapes our brain and the more likely we are to think and act along similar thoughts in the future. So, the more often someone has violent thoughts, the more likely they are to be violent; or, the more often someone experiences empathy, the more likely they are to be kind. Meanwhile, yoga teaches us that everything is ultimately one; that we are connected with all beings, and that all the violence we see in the external world is a reflection of violence we hold within ourselves. At first take this seems a little out there; it suggests that I have a reflection within myself of something as horrific as someone else committing a school shooting. However, as a physics major, I know the statement “all things are connected” is proven beyond the shadow of doubt… and I’ve come to see that this fundamental truth provides key insight into creating change (via more than just clamoring on social media). In reflection, I’ve found that my thoughts actually can be quite violent, both to myself and others. If I really let myself go there, I can admit that there are times in which the voices in my head are saying things about others (and even more about myself) that are awful, and certainly not peaceful. In being honest and vulnerable about my own inner violence, I can take responsibility (read “response-ability”) for my own part in the collective consciousness, and do what neuroscience and yoga tell me to do: change my own mind to change the world. Truly the quote should read “with great responsibility comes great power,” for when we take full responsibility for our own experience and change our own minds, we not only shift the collective consciousness, we also show up more powerfully and courageously in our words and actions. Now, I’ve been fortunate—as an upper-middle-class white male with a strong family and community network—to receive plenty of social-emotional development with which to keep my violent thoughts as just thoughts, and (at least more often than not) make life-affirming choices. I’ve built neural pathways to support this from years of positive reinforcement; I’ve received the neuroscientific benefits of my privilege. However, this support for social-emotional development is sadly not a reality for millions upon millions of students growing up in the United States today. While many of us are quick to jump to laws and policies as vehicles for social change—we have to also realize that our schools are not currently places where love, kindness, respect, and self-worth are thriving. They are largely filled with stress, injustice, sadness, anger, and isolation. Why, you might ask? We have to be aware that, by and large, educators are overwhelmed, undervalued, and don’t have social-emotional tools and support to take care of themselves. We are asking them to do the impossible: to teach our students to be compassionate, connected, positively contributing members of society without valuing or empowering them as the same. Thus, our standardized, test-driven system is devaluing and hanging out to dry our teachers; the very people who are setting the standard for the next generation. When teachers are happy, healthy, and embodying their whole and brilliant selves, then students will as well. However, when teachers are stressed, frustrated, and overwhelmed, what do we expect to happen? Remember, it’s neuroscience. Can we really point the finger anywhere but ourselves on this one? Yes, gun laws and policy reform are critical. And no, we can’t expect the education system to change overnight. However, one solution to violence that we each DO have control over is to first take responsibility for our own minds and relationships, and then to show up and provide our students AND teachers with the tools and support they need to regulate their emotions, build social connections, and make positive life decisions. Education in the 21st century can no longer be about simply memorizing facts, performing on tests, and learning to think critically. We must also learn skills such as compassion, empathy, and gratitude so that we are not just doing well; we are also being well. Only once critical social-emotional skills—which research repeatedly shows are skills—are learned will violence in our schools truly subside. The bright side is: this may not take as long as it initially seems. Millions of educators in the U.S. chose to enter the profession because they wanted to make a difference in their students’ lives and they wanted to see a better tomorrow for our country. Many of them are currently stressed, burned out, and without the tools and support they need to accomplish this vision. But this is changing. Since our Founder & CEO Dr. Ilana Nankin started Breathe For Change–our movement by teachers for teachers—out of her dissertation research in 2015, over 2,000 educators across 11 cities have committed to 200 hours of training to be certified as yoga instructors and wellness champions. Our graduates are now providing more than 100,000 students with a role model embodying skills such as stress reduction, emotional regulation, and compassion. In witnessing what becomes possible when educators unleash their passion, brilliance, and love, we have continually renewed our faith in humanity. Imagine what schools will look like when all educators are empowered with wellness tools, support, and strategies to show their students how to breathe, calm down, feel connected, and decide to put down the guns and pick up their neighbors’ hands. That’s the world I want to live in—and I hope you’ll join us in creating it. I'm a tech and spiritual entrepreneur living each moment to the fullest. I believe that we are each meant to be our whole, brilliant, and authentic selves for a living... and that education is the way to get us there.